“We Bhutanese are an endangered species,” my friend, the former Gelephu National Council Member, is fond of saying. He means that partly in jest. But, in many ways, I find that to be true indeed. In an increasingly complex world, vexed by major economic disruptions, a deteriorating environment, an excess of consumerism, and reduced attention spans, Bhutan alone stands apart. An endangered species, indeed. As a Bhutanese boy, I spent my early childhood years shuttling back and forth between school in India, the quiet, mistwreathed village where my mother grew up, and what was even then a bustling capital. The place I called home, Thimphu, was where my father worked in one of the long single-storeyed, whitewashed red-roofed buildings next to the massive Thimphu Dzong. Back then, my father and his colleagues dreamed up agricultural outreach projects to help rural farmers boost crop production. They were the cream of the first crop of Bhutanese educated in the western way. They learned about production numbers, economies of scale and other such fancy concepts that made their rural peers bow with their white kabneys lowered humbly before them. And yet, from their carpeted official chambers, they could hear the long low blasts of the temple horns, the plaintive cries of the jhaali pipes and the dhung dhung dhung of the temple drums, which meant that their monastic brethren were making important contributions of an entirely different kind. And when the time came to enter the dzong and receive the monks’ blessings, both “government officers” and “village farmers” bowed identically before their maroon-robed brothers. These vastly different worlds coexisted side-by-side, none excluding the other in the exquisite dance of modernity and traditionalism. As a Bhutanese man, I frequently find myself splitting time between Bhutan and the United States, living a double-life in two extremely different ends of the world. And I don’t mean that merely in a physical sense. Yes, a vast range of mountains, foothills, plains, ocean and land separates the snowy Himalayas from the sunny climes of California. But perhaps even a wider gulf is the leap of perspective it requires of a Himalayan boy to enter the river of western life. How else to make sense of, or even keep up with, the perpetual progression of technology, the new must-have gadgets, and the latest and the best of everything- the seductive toys that can easily lead a man to distraction? Normally, it is this kind of thing that leads to a rejection of one’s older, quieter, native, roots. The halls of American success stories are littered with endless examples of immigrants who made good by reinventing themselves; people who shed their former languages, former accents, favourite foods, spices, clothing, and other cultural vestments, all in the name of the mad rush to blend in, to be assimilated, to forget and, to ultimately rise, phoenix-like, from the ashes of one’s former identity. But in my case and, I suspect, in the case of many other Bhutanese who have lived abroad, temporarily or temporally, it is our very “Bhutanese-ness” that we use as a failsafe device to navigate to our true spiritual south. 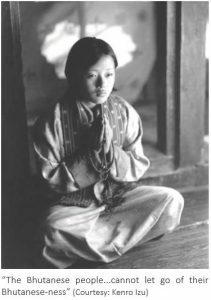 For instance, when someone cuts me off in traffic, instead of leaning on the horn, I take a deep breath and close my eyes to create a “spaciousness” in my mind, the way my Bhutanese mother taught me in her womb and on her lap. I send out a mental link of empathy for the harried person, the poor soul rushing headlong through a crowded daily list of things to do. “Who knows, this woman may have been your mother, your father, or your child in a previous life,” my gentle Ama says in my mind. “Love them in the same way and let your mind be at rest.” I think of the deep faith with which my mother says this, the way she bows her head like a blade of grass in a temple, the way she closes her eyes to internalise her prayers to Tara, the Mother of All Compassion. Holding this thought firmly in my mind, irritation turns to sympathy, or perhaps even empathy – “perhaps her father lies dying in the hospital, and she has to race to get there in time to say goodbye.” Thus, my Bhutanese upbringing makes me sensitive to the human stories swirling around us everyday, the soft vulnerability we all share just beneath the hardened shell we present to the world. As a Bhutanese person I am taught to understand that the cocoon we build around ourselves to protect us from further injuries can eventually become mental prisons of conditioned behaviour that binds us in the suffering of samsara. This, ultimately, is the breadth of my Bhutanese upbringing, this ability to take a longitudinal view of things spanning serial lifetimes while enabling me to function with grace in the present one. “The Bhutanese people, no matter where they are, cannot really let go of their Bhutaneseness,” a very eminent Bhutanese politician told me once. “For a Bhutanese person to truly make a mark in the world, they have to cut that umbilical cord, and compete in the global marketplace. They have to think big!” he said. “They have to stop constantly returning to the subject of Bhutan, and move on. Think about writing not just the great Bhutanese novel but the great New York Times Bestseller!” I was never sure if this was pep talk, criticism, political rhetoric or just a cynical point of view. In any event, my opinion is that it is the very specificity of our Bhutanese experience that makes us special and competitive. Perhaps not in the way that brings more money with which to buy further “distractions”, but in the way of emotional health and a lightness of being that even billionaires, and maybe especially billionaires, can only dream of. It is our unique Bhutanese strength that our culture primes us from birth to seek the deeper and more lasting sources of happiness. It is our special Bhutanese perspective which gives us that longer, wider view. It is ultimately a mark of Bhutan’s true greatness as a nation that no matter how far afield her sons and daughters go, no matter where they live, which garb they wear, and which jobs they take up , they never forget their one true spiritual home. They continue to keep the flames of Bhutan alive in their lives. Talk of their Himalayan home, a tidbit of international news about the kingdom, and their eyes brighten and they are animated with joy. They welcome their compatriots in distant lands with open arms. In their common shared memories of home, their families back in Bhutan become one. They talk, they eat, and they rummage through their pantries for dwindling supplies of red rice, dried red chillies and dried lom, hoarded preciously for just such an occasion. And as the delicious aroma of the meal wafts through the tiny apartment in some crowded low rent part of an immensely wealthy island of skyscrapers, identical smiles spread across the faces of the people gathered together for this little treat. There is laughter, savouring, and the heady hit of chilli pepper heat and, finally, a craving fulfilled. As the meal comes to an end, an all-encompassing glow gradually envelops the gathered group. And as they rest from the meal, the hush of such deep satisfaction which settles over them would merit the envy of even the imagined tycoon who stands over them in a sanitised tower high above their little world, staring at the signs of teeming lives spread below him, the scrambling millions of the world’s heaving and striving people nipping at his heels! About Author: Karma Singye Dorji is the author of Dreaming of Prayer Flags: Stories and Images from Bhutan. Karma organises, designs and leads adventure tours and cultural explorations for Bhutan Orient Expeditions (www.bhutanorient.com).